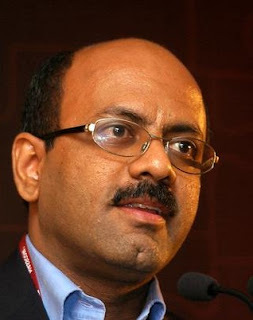 Chairman, MD, & CEO, Subex Ltd.
Subex Ltd (BSE: 532348, NSE: SUBEX) counter in National Stock Exchange on Tuesday, 8th May 2012, saw a significant institutional sell of 12.50 lakh shares and a matching buy by a noted individual investor. The sell by Credit Suisse (Singapore) Ltd and the buy by Utpal H Sheth were disclosed by NSE after trading hours on Tuesday. While the FII is an arm of the Swiss banking and financial services giant, Credit Suisse Group, Utpal H Sheth is a senior finance professional, noted investor, and a top executive in Rare Enterprises, the investment company founded by celebrity investor, Rakesh Jhunjhunwala. Credit Suisse (Singapore) sold 12.50 lakh shares of Subex at Rs. 23.75 a share, while Utpal H Sheth bought 12.49 lakh shares at the same rate. As of Q4 end, the Swiss FII held a 1.80% stake in this medium-sized software services provider focused on the telecommunication sector. Tuesday’s sell by Credit Suisse also amounted to 1.80% stake, and as such, hints at a full exit by this FII from this counter. The sale raised Rs. 2.97 crore. Utpal Sheth had no identifiable (+1%) stake in Subex, while Rakesh Jhunjhunwala held a 1.80% stake as per the latest Share Holding Pattern (SHP). The last identified buy by Credit Suisse in the counter was on April 20th 2011, when it picked up 14.50 lakh shares at an average price of around Rs. 76 a share. The last identified sell by the FII was on 14th October 2011, when it sold off 4.50 lakh shares at Rs. 41.64 a share. Tuesday’s sell has come at Rs. 23.75, at nearly half the rate it got during October, and one-third of its buying price in April 2011. Interestingly, Subex’s 52-Week Low is at Rs. 22.80 that didn‘t give much scope for averaging, and which means that Credit Suisse is exiting with significant losses. Indeed, it was quite difficult to make meaningful investment returns in Subex during the current year-to-date with the scrip on a steady free-fall. The two-year and five-year charts also show deep value erosion, and Subex is often pointed out as an example of Indian mid-cap companies failing to live up to their promises and consequent exorbitant valuations during the last bull run, and causing massive losses to their investors. Subex’s all time-high, that happened during the FY’07 bull run, was a now-unbelievable Rs. 803.25, marked in January 2007. At Tuesday’s close of Rs. 23.75, it is a staggering loss of 97% within 5½ years. The woes are continuing in Subex. For the first three quarters of FY’12, consolidated revenue has barely grown, while consolidated net profit has fallen by 70% over the same period of the previous fiscal. Apart from core performance issues, the software firm has been plagued for long by high debt, especially a maturing FCCB repayment worth $131 million. Recently it had got a reprieve when RBI agreed for a restructuring plan for the FCCBs which Subex claims is backed by their bondholders. According to this plan, around 25% of the existing FCCBs will be converted to equity, and against the rest, fresh FCCBs would be issued. The market had briefly applauded the move, rebounding the scrip by around 20% from its monthly low, but Subex was again caught by a falling market taking its cue from the weakening rupee. Credit Suisse’s sell on Tuesday has come at this stage, when the scrip has again come dangerously close to its 52-Week Low, raising fears of a fresh down move. Apart from the FCCBs, the company has around $40 million in debt, some of which is in foreign currency. But, for today’s significant buyer, and Jhunjhunwala aide, Utpal H Sheth, the hope seems to be on a quick resolution to the FCCB issue which will cut the interest costs, and remove a significant overhang on the stock. It remains to be seen whether this buy by a key member of the RJ camp is just averaging at lower prices or something more ambitious. A serious concern with the company and its stock include a low promoter holding of 11.69%, which can further come down on FCCB conversion. Also, 93.83% of even this low promoter holding has been pledged. Subex is yet to announce its financial results for Q4 and FY’12. On Tuesday, the stock closed down at Rs. 23.75 in NSE, down by 0.42%, in a market which saw Nifty falling by 2.23%.